The mission of the Montgomery Music Project (MMP) is to develop young people and bring communities together through music. We do this by delivering affordable, high-quality music instruction to the children of Montgomery and the River Region and by uniting diverse geographic, ethnic, and socio-economic communities under the umbrella of the arts. 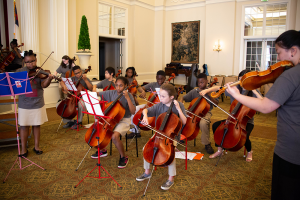 Since 2011, MMP has provided highly trained teachers to give instruction in violin, viola, and cello, as well as in music theory, history, ear-training and more. MMP operates under the auspices of the Montgomery Symphony Orchestra.